Thank you CheerPrints for the awesome team shirts!!! PA Heat has relocated to a larger facility just a few minutes away! Our new address is: 2965 E. High Street Pottstown, PA 19464 We are located near the Philadelphia Premium Outlets off the Sanatoga exit from 422. Congratulations to our Tiny Embers – Epic National Champions! 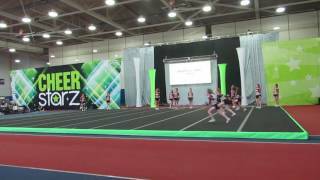 Congratulations to our Tiny Embers taking 1st place at Epic/Spirit Unlimited Platinum Nationals in Reading, PA on April 10, 2016! Great job girls!!! Special thanks to our sponsors for the 2016-2017 season! PA Heat is looking for members to join it’s National Championship Open Level 6 Team! Athletes 17 & over please contact Heather @ heath720@verizon.net for more information. Practices are Sundays from 4pm to 5pm starting September 14th! 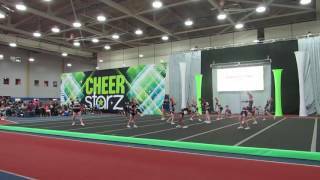 Special Needs Team – PA Heat Sparkles! Congratulations Senior 4 Co-ed Blackout and Senior 3 Firestorm! Congratulations to Senior Co-Ed Level 4 Blackout and Senior Level 3 Firestorm for winning National Championships at Battle at the Capitol in National Harbor on February 7, 2016! PA HEAT Cheer Camp 2015 will run from June 22nd till August 14th. “Tumbling Clinic” will be 10am-2pm Mon-Fri – $150/week “Extended Camp” available 7:30am-5:00pm Mon-Fri – $200/week Sign up at the front desk at the gym, or online http://paheatallstars.com/?page_id=243. We hope to see you there!